For the days when it's too hot to function longer than 2 seconds, rompers are the simplest morning savers. Just love this cute, easy denim romper from Motel, which I luckily snagged for half off on one of their crazy flash sales. It's so comfortable, lightweight, and effortless (and yeah it's worth the extra minute in the bathroom stall getting half naked). Also found this amazing Stela 9 bag at a sample sale this past week at the Cooper Building - most of their tenants have a sample sale the last Friday of the month, so definitely head over there if you can, especially to Stela 9. Can't wait to show you the rest that I got. So proud of my growing collection of Stela 9's! P.S. don't forget to enter LAST NIGHT's giveaway! I love that romper! and I really like the way you styled your hair. Sounds weird, but you actually have the most stunning face. So pretty, I love your necklace! Really like the way you look! For a second, I thought it was a two piece outfit! I love your romper! Thanks for all the lurve! You're the best! LOVE this blue on blue look- perfect! 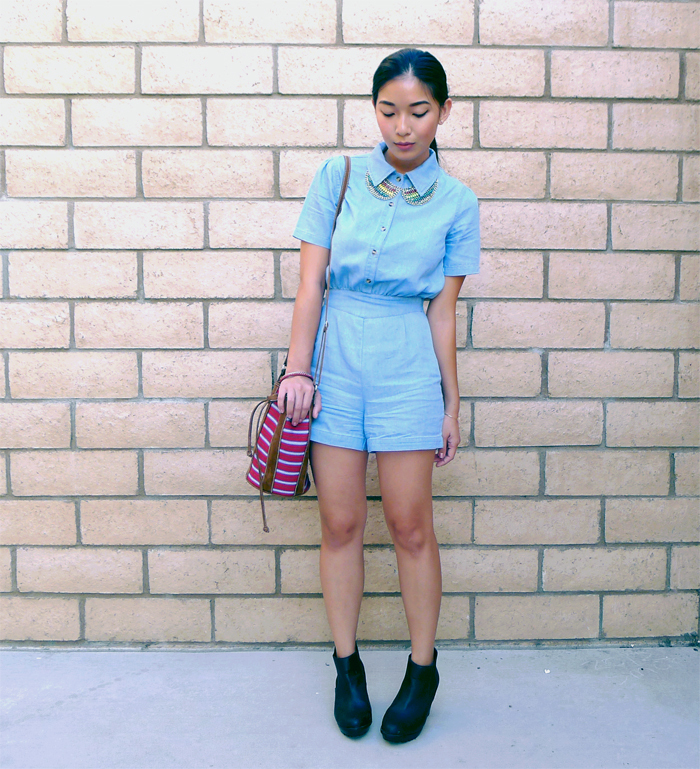 I love this romper and how you styled it!